St. Joseph, husband of the Mother of God, pray for us! I never weary contemplating you and Jesus asleep in your arms; I dare not approach while He reposes near your heart. Press Him in my name and kiss His fine Head for me and ask Him to return the Kiss when I draw my dying breath. St. Joseph, Patron of departed souls – pray for me. Amen. It is true that the creature loves less because she is less. But if she loves with her whole being, nothing is lacking where everything is given. We Have a Mother in Heaven! I Am All Thine, My Queen and My Mother, and All That I Have is Thine! Indeed, rereading it has helped me to gain greater insight into the richness of this devotion and how to live it out in my daily life. The next (suggested) Total Consecration preparation begins on Nov. 5 and ends on Dec. 8, the feast of the Immaculate Conception. Order the Total Consecration book, or use this website which offers a very thorough explanation of how to proceed and includes links to all readings and prayers so that ordering books is not necessary. Happy Memorial of the Immaculate Heart of Mary!! 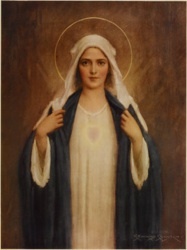 Most Holy Virgin Mary, tender Mother of men, to fulfill the desires of the Sacred Heart of Jesus and the request of the Vicar of Your Son on earth, we consecrate ourselves and our families to your Sorrowful and Immaculate Heart, O Queen of the Most Holy Rosary, and we recommend to You, all the people of our country and all the world. Please accept our consecration, dearest Mother, and use us as You wish to accomplish Your designs in the world. O Sorrowful and Immaculate Heart of Mary, Queen of the Most Holy Rosary, and Queen of the World, rule over us, together with the Sacred Heart of Jesus Christ, Our King. Save us from the spreading flood of modern paganism; kindle in our hearts and homes the love of purity, the practice of a virtuous life, an ardent zeal for souls, and a desire to pray the Rosary more faithfully. We come with confidence to You, O Throne of Grace and Mother of Fair Love. Inflame us with the same Divine Fire which has inflamed Your own Sorrowful and Immaculate Heart. Make our hearts and homes Your shrine, and through us, make the Heart of Jesus, together with your rule, triumph in every heart and home. Happy Solemnity of the Most Sacred Heart of Jesus! O Most Merciful Jesus, I consecrate myself today and always to Your Most Sacred Heart. 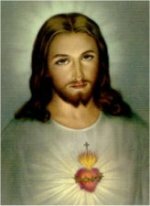 Jesus, meek and humble of heart, make my heart like unto thine! Most Sacred Heard of Jesus, have mercy on me! Maryâ€™s rosary is our picture book of faith, hope, and love. Here in the unfolding images of Christ life: In His joys, through His luminous love, in His sorrows, in His glories; he prepares us for everything that will take place. The will of God is being realized in each event of Christâ€™s life, in Maryâ€™s life, and in our life. And Mary will help us say â€œYes,â€ and give our free and full assent to His divine plan. Every day human life is under attack. If it were not enough that our elected leaders and judges too often have failed to stand up for vulnerable pre-born babies, or the disabled or the dying, every election campaign seems to be a referendum on the dignity and value of human life. Candidates who would stand with us valiantly against abortion or assisted suicide are labeled â€œextremeâ€ and fanatical. Mary, we will not abandon your dear children, but we know that the proponents of these evils will not give up without a fight. Our Lady of the Rosary, Our Lady of Life: Win among us the battle we cannot win without your help. Turn back the culture of death in our nation. Save us from the tyranny and deceit of Choice. Hail Mary, Hail Mary, Pray for us sinners. It was so as not to hear this that I never wanted to grow up, feeling that I was incapable of making my living, the eternal life of heaven. I’ve always remained little, therefore, having no other occupation but to gather flowers, the flowers of love and sacrifice, and of offering them to God in order to please Him. I rushed headlong â€“ I, misshapen. This is the devotion consists in making oneself a slave of Mary, doing all our actions by Mary, with Mary, in Mary and for Mary. We offer to the Blessed Mother every thought, word, deed and desire so that she might purify them and present them to our Lord to be distributed where they are most needed. It is a total abandonment to the Blessed Virgin Mary who will in turn lead us into a perfect union with Christ, her Son. By Jesus Christ, with Jesus Christ, in Jesus Christ we can do all things; we can render all honor and glory to the Father in the unity of the Holy Ghost; we can make ourselves perfect and be for our neighbor a fragrance of eternal life. What I love about this devotion is that it is nothing short of a perfect imitation of Christ who spent almost His entire life on earth completely subject to His Blessed Mother. I think of the finding in the temple, when Jesus, ready begin his public ministry at age 12, left His parents in Jerusalem to go preach to the elders in the temple. Seeing how this upset his Mother, Jesus returned home and was “obedient” to her, living hidden in Nazzareth with his mother for another 18 years. This devotion echoes not only Christ’s love for His Mother, but also His sublime humility. Our Lordâ€™s words teach us that though we labour among the many distractions of this world, we should have but one goal. For we are but travellers on a journey without as yet a fixed abode; we are on our way, not yet in our native land; we are in a state of longing, not yet of enjoyment. But let us continue on our way, and continue without sloth or respite, so that we may ultimately arrive at our destination. 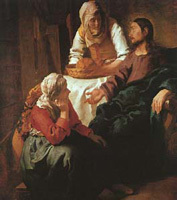 Martha and Mary were sisters, related not only by blood but also by religious aspirations. They stayed close to our Lord and both served him harmoniously when he was among them. Martha welcomed him as travellers are welcomed. But in her case, the maidservant received her Lord, the invalid her Saviour, the creature her Creator, to serve him bodily food while she was to be fed by the Spirit. For the Lord willed to put on the form of a slave, and under this form to be fed by his own servants, out of condescension and not out of need. For this was indeed condescension, to present himself to be fed; since he was in the flesh he would indeed be hungry and thirsty. Thus was the Lord received as a guest who came unto his own and his own received him not; but as many as received him, he gave them the power to become sons of God, adopting those who were servants and making them his brothers, ransoming the captives and making them his co-heirs. No one of you should say: â€œBlessed are they who have deserved to receive Christ into their homes!â€ Do not grieve or complain that you were born in a time when you can no longer see God in the flesh. He did not in fact take this privilege from you. As he says: Whatever you have done to the least of my brothers, you did to me. But you, Martha, If I may say so, are blessed for your good service, and for your labours you seek the reward of peace. Now you are much occupied in nourishing the body, admittedly a holy one. But when you come to the heavenly homeland will you find a traveller to welcome, someone hungry to feed, or thirsty to whom you may give drink, someone ill whom you could visit, or quarrelling whom you could reconcile, or dead whom you could bury? No, there will be none of these tasks there. What you will find there is what Mary chose. There we shall not feed others, we ourselves shall be fed. Thus what Mary chose in this life will be realised there in all its fullness; she was gathering fragments from that rich banquet, the Word of God. Do you wish to know what we will have there? The Lord himself tells us when he says of his servants, Amen, I say to you, he will make them recline and passing he will serve them. 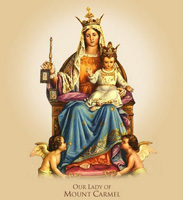 For more information on Our Lady of Mt. 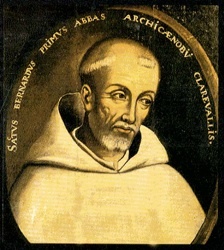 Carmel listen to this “Saint of the Day” podcast for July 16. The man who is filled with the Holy Spirit speaks in different languages. These different languages are different ways of witnessing to Christ, such as humility, poverty, patience and obedience; we speak in those languages when we reveal in ourselves these virtues to others. Actions speak louder than words; let your words teach and your actions speak. We are full of words but empty of actions, and therefore are cursed by the Lord, since he himself cursed the fig tree when he found no fruit but only leaves. 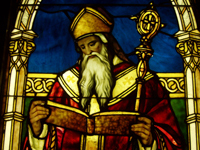 Gregory says: â€œA law is laid upon the preacher to practice what he preachesâ€. It is useless for a man to flaunt his knowledge of the law if he undermines its teaching by his actions. But the apostles spoke as the Spirit gave them the gift of speech. Happy the man whose words issue from the Holy Spirit and not from himself! For some men speak as their own character dictates, but steal the words of others and present them as their own and claim the credit for them. The Lord refers to such men and others like them in Jeremiah: So, then, I have a quarrel with the prophets that steal my words from each other. I have a quarrel with the prophets, says the Lord, who have only to move their tongues to utter oracles. I have a quarrel with the prophets who make prophecies out of lying dreams, who recount them and lead my people astray with their lies and their pretensions. I certainly never sent them or commissioned them, and they serve no good purpose for this people, says the Lord. We should speak, then, as the Holy Spirit gives us the gift of speech. 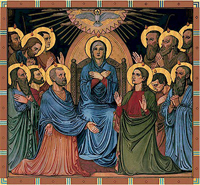 Our humble and sincere request to the Spirit for ourselves should be that we may bring the day of Pentecost to fulfilment, insofar as he infuses us with his grace, by using our bodily senses in a perfect manner and by keeping the commandments. Likewise we shall request that we may be filled with a keen sense of sorrow and with fiery tongues for confessing the faith, so that our deserved reward may be to stand in the blazing splendour of the saints and to look upon the triune God. Happy Solemnity of Corpus Christi! I am the living bread that came down from heaven; whoever eats this bread will live forever; and the bread that I will give is my flesh for the life of the world. Amen, amen, I say to you, unless you eat the flesh of the Son of Man and drink his blood, you do not have life within you. Happy Birthday, Holy Mother Church! Come, O Creator Spirit blest! And in our souls take up Thy rest; Come with Thy grace and heavenly aid, To fill the hearts which Thou hast made. Great Paraclete! To Thee we cry, O highest gift of God most high! O font of life! O fire of love! And sweet anointing from above. Thou in Thy sevenfold gifts art known, The finger of God’s hand we own; The promise of the Father, Thou! Who dost the tongue with power endow. Kindle our senses from above, And make our hearts overflow with love; With patience firm and virtue high The weakness of our flesh supply. Far from us drive the foe we dread, And grant us Thy true peace instead; So shall we not, with Thee for guide, Turn from the path of life aside. Oh, may Thy grace on us bestow The Father and the Son to know, And Thee, through endless times confessed, Of both, the eternal Spirit blest. All glory while the ages run Be to the Father and the Son Who rose from death; the same to Thee, O Holy Ghost, eternally. Amen. 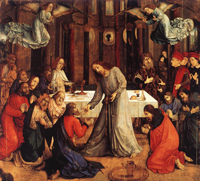 Spirit Gives Life to Universal Church, on Pope Benedict’s Pentecost message.